During the last few days the news are talking about the “Supermoon” happening on Monday 14th November. The reports (some examples here, here and here) say that “it will be the brightest Full Moon in years“. 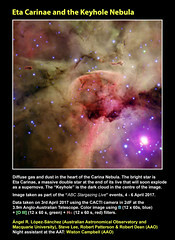 Even we at the Australian Astronomical Observatory have been asked about this “very rare phenomenon“. But how much is true about all of this? Let’s take a look. First of all we should have clear that the Moon, as any other small body moving around a larger body, has an elliptical orbit. 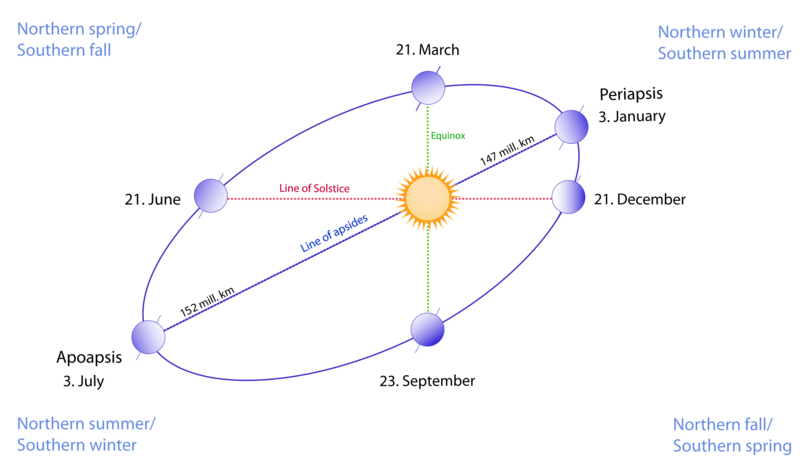 Diagram explaining the movement of the Moon around the Earth following an elliptical orbit and defining the perigee and the apogee. Not in scale. Credit: Ángel R. López-Sánchez. Moon image: Paco Bellido. Planets also move around the Sun following elliptical orbits, as it was discovered by the great astronomer (and the first real astrophysicist in History, although he also had to work as an astrologer to get a salary) Johannes Kepler at the beginning of the 17th century. This means that sometimes the Moon is closer to the Earth and sometimes it is farther from the Earth, just depending on where it is located within its orbit. 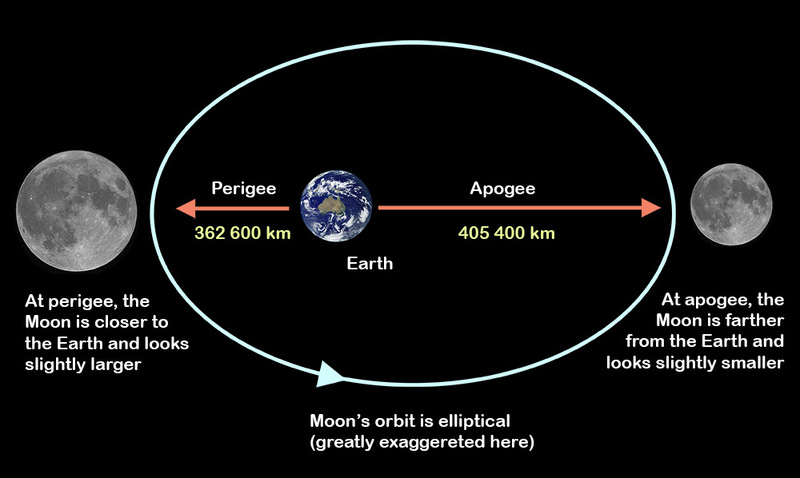 The point on the Moon’s orbit closest to Earth is called the perigee (at an average distance of 362 600 km) and the point farthest away is the apogee (at an average distance of 405 400 km). On average the Moon-Earth distance is about 382 900 kilometers. 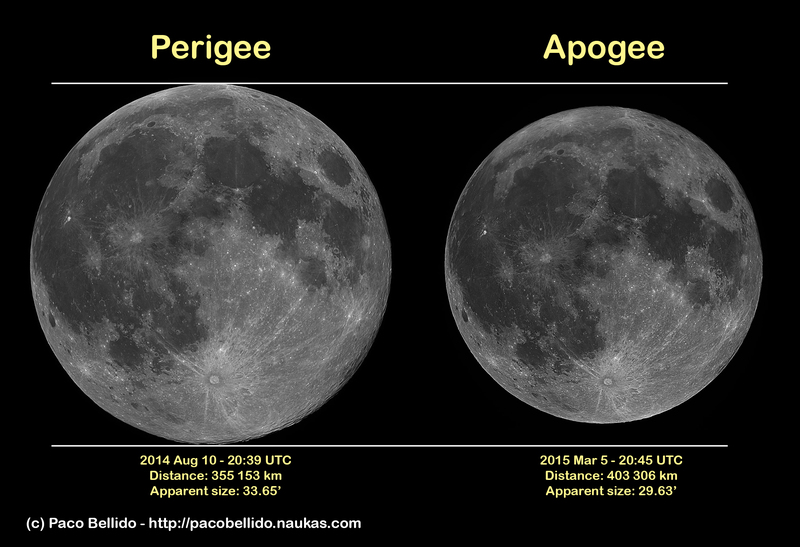 Comparison of the apparent size of the Moon when it is located at the perigee (left) and when it is at the apogee (right). Credit: Paco Bellido. These photos were taken by the Spanish astrophotographer and friend Paco Bellido in 2014 and 2015 from Córdoba (Spain), my natal city, and clearly show the different apparent size that the Moon has at the perigee (left) when compared to where it is at the apogee (right). What does happen when the full moon coincides with the perigee? Well, that is a supermoon! The next time this will occur is next Tuesday, 15th November, 12:52am Sydney time. In that moment the Moon will be ~13% larger and ~30% brighter than a full moon happening in the apogee (a “micromoon“). From Sydney (and Australia) the best moment to see it will be on the evening of Monday 14th November, and actually many people are planning to enjoy watching the “supermoon” appearing over the Pacific Ocean at the dusk from Sydney’s famous beaches and clifts. Regarding this, it is important to say that our brain tricks us when observing the Moon or the Sun close to the horizon: they do appear to be larger than they do higher up in the sky. This is called the Moon illusion, some studies suggest that the perception is that the Moon is almost 3 times larger near the horizon that when located near the zenith. 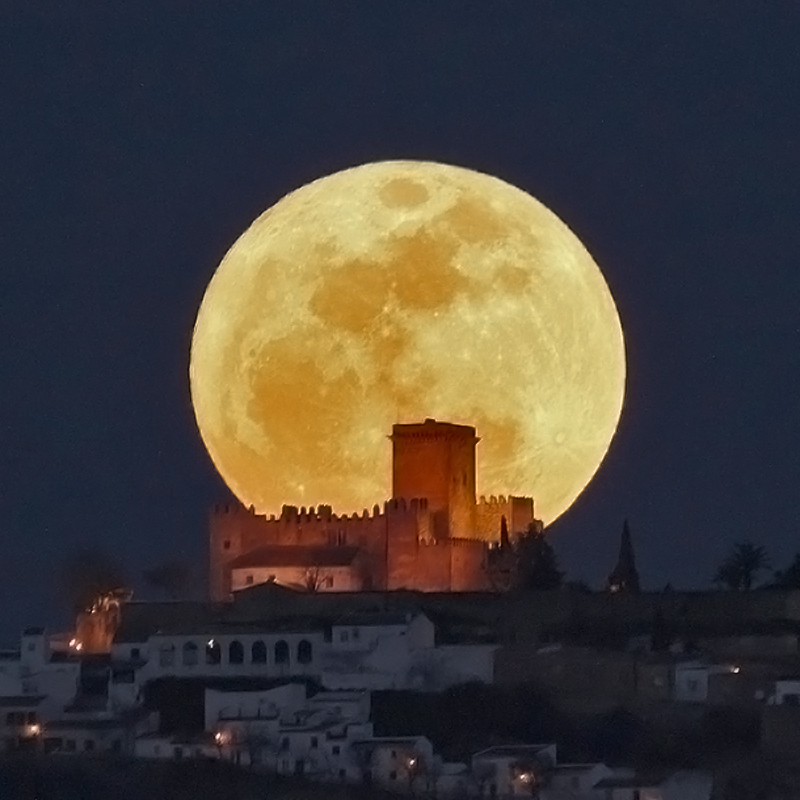 Supermoon over Espejo’s Castle (Córdoba, Spain) on 20th March 2011. This photo, taken by Paco Bellido, has been widely used in many places since then. Now people still try to reproduce this photo with their cameras when full moon… More info (in Spanish) in Paco’s blog “El beso en la luna“. Credit: Paco Bellido. However, I must insist that the term “supermoon” does not come from Astronomy but from the pseudoscience of astrology. Perhaps that is one of the reasons why many people are talking about this. The term “supermoon” was coined by the US astrologer Richard Nolle in 1979, who defined it as ‘a New or a Full Moon that occurs when the Moon is at or near (within 90% of) its closest approach to Earth in its orbit’. Nolle, who associated supermoons to catastrophes without any scientific evidence that this was true, didn’t know that we astronomers already had a scientific term to describe this alignment: the perigee-syzygy of the Earth-Moon-Sun system. The word “syzygy” means a perfect alignment between three bodies, that are in a perfect straight line. The most famous examples of syzygies are the lunar and solar eclipses, when the alignment of the Sun, Earth and Moon happens on the lunar nodes (the two points where the plane of the orbit of the Moon around the Earth and the plane of orbit of the Earth around the Sun intercept). As other “expressions”, such as “blood moon” (a lunar eclipse) or “blue moon” (the second full moon within the same calendar month), the term “supermoon” has become very popular lately, perhaps also because all the action in social media. But these definitions are not official astronomical terms. Indeed, a “blue moon” does not have a proper astronomical definition, and may happen or not depending on the time zone the observer is located. In any case all the excitement about the supermoon happening on Tuesday 15th (for us in Sydney, but for the majority of the world on Monday 14th) it that the exact moment of the full moon (12:52 am Sydney time) is really close to the perigee, happening at a distance of only 356 536 km from us. The supermoon was not that close since 26th January 1948, when it was at 356 460 km, and it will not be that close till 26 November 2034, when it happens at 356 472 km. Check the numbers, please. 356 532 km, 356 460 km, 356 472 km… they all just differ in tens of kilometers! That is only a difference of a 0.02% ! Even considering the distances happening on other supermoons (I forgot to say we typically have 2-3 supermoons per year, last 17th October and next 13 Dec will be also supermoons), the differences are just within around 500 km, what is translated into a difference of only 0.14%. 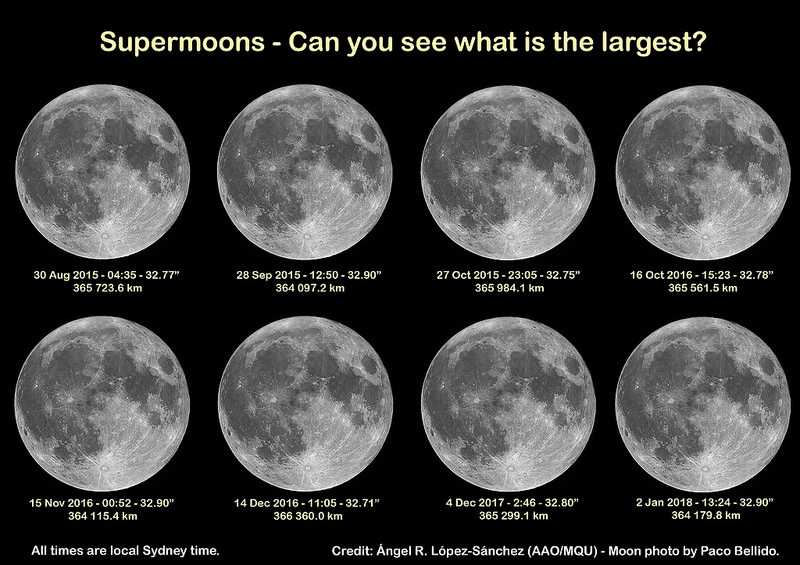 Illustration: Supermoons: can you see what is the largest? 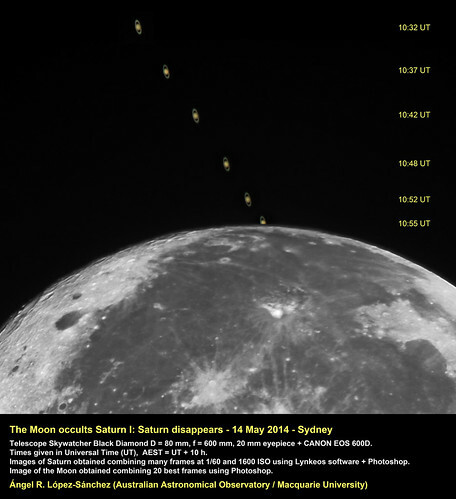 Eight supermoons between 2015 and 2018, images have been scaled to the apparent size of the Moon considering its distance from Sydney when the full moon is happening. The dates are times indicated are the moment of the Full Moon. The sizes and distances are computed assuming the observer is located in Sydney, Australia. This is an illustration, not real photos taken from Sydney (I can’t travel to the future!). The original Moon image is the photo of the “micromoon” that Spanish astrophotographer Paco Pellido took on 5 March 2015 from Córdoba, Spain, which is the image I use in this post. An image without labels can be found here. The high resolution image is available here. Credit: Ángel R. López-Sánchez, Moon Photo Credit: Paco Bellido. Let me say it again: the difference of the distance between the Earth and the Moon during a “supermoon”, with these happening typically 2-3 times per year (for full moon, 4-5 times per year in total including new moon), is only the 0.14%. Do you think you’ll be able to notice this with your naked eye? However, giving numbers (talking quantitatively) the media can say “it is a rare event, the closest supermoon in almost 70 years“. But in practice you’ll not notice a thing. It will be a supermoon essentially similar to all of those we have every year. Distance from the observer to the Moon depending on when rising or setting (top) or when it is near the zenith (bottom). Credit: Ángel R. López-Sánchez. Moon image: Paco Bellido. There is more. 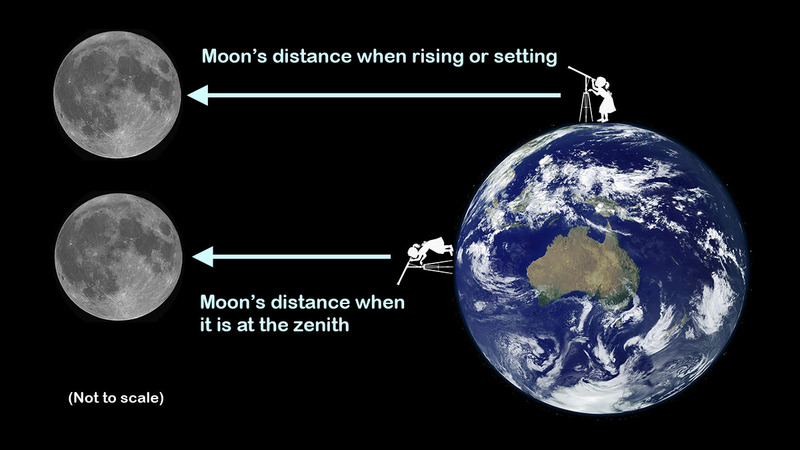 Besides the lunar illusion, the moon is actually a bit further away from us when it is rising or setting than when it is near the zenith, as the image above clearly shows. The difference on the distance between the observer and the Moon may vary between few thousand an twelve thousand kilometers. This is called “diurnal effect” as it is, indeed, larger than the difference of few hundreds of kilometers found for supermoons. In both cases, I insist, the differences on the apparent size of the Moon can’t be noted with the naked eye. Here again it is important to have a bit of critical thought about what all of this means. In any case this “supermoon” is a great excuse to forget about our domestic problems, look at the sky and be amazed by all the beautiful things that are hiding among the stars. Supermoon: closest Full Moon to Earth since 1948 (Time and Date). Moon Distance Calculator (Time and Date). I’ve included the illustration comparing the size of the Moon for 8 supermoons, as seen from Sydney. This started as a game in social media on Monday. I also prepared this illustration showing the sizes of the 12 full moons in 2016, as seen from Sydney. Do you identify the micromoon and the 3 supermoons? Illustration: Full Moons in 2016 as seen from Sydney. 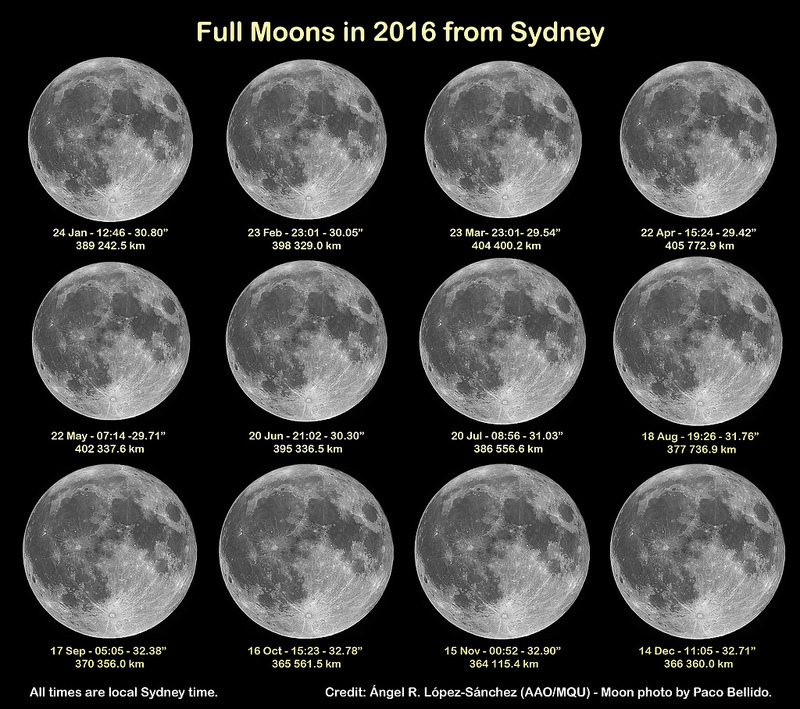 All the full moons in 2016, scaled in size following the Moon’s apparent size as seen from Sydney. The micromoon corresponds to 22nd Apr (top right) and the thre supermoons are 16 Oct, 14 Nov (15 Nov Sydney time) and 14 Dec. This is an illustration, not real photos taken from Sydney (I can’t travel to the future!). The original Moon image is the photo of the “micromoon” that Spanish astrophotographer Paco Pellido took on 5 March 2015 from Córdoba, Spain, which is the image I use in this post. The image without labels is here. A high resolution image is available in my Flickr. Credit: Ángel R. López-Sánchez. Moon photo credit: Paco Bellido. I spend a lot of time with my son, Luke. He turned 3 last January and, after the terrible “terrible twos” phase he is a very different and charming little person now. He has been always obsessed with letters and numbers. Indeed he does not only know his ABC’s in Spanish and in English but he also identifies Greek letters (*). He has been doing these for around a year (the Greeks letters since Christmas). Lately he’s even writing letters by himself in his (several) blackboards or in the sand at the beach. And with numbers he’s always counting everything: pieces of food, toys, steps… I think he is starting to understand what additions and subtractions are. Yes, I do have a lot of fun playing with him (not that much when it is 10pm and he refuses to go to bed, but, ey, we’re Spanish, going to bed at 10pm is not bad seen in our native country… it must be on the genes…). Of course I also talk about Astronomy to him. Using “glowing in the dark stars” we drew constellations in his bedroom. He now knows what “the Southern Cross“, “Orion” and “Scorpius” are, even the Pleiades (not a constellation, just a a star cluster or an asterism). A couple of weeks ago I got a small book about Astronomy for him. 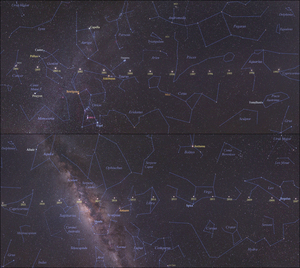 In only 50 pages it compiles planets, constellations, star clusters, nebulae and galaxies. It is not a book for a 3 years old, but I wanted to show him the photos of the planets. And he was fascinated about that! Since then, every night, I have to take him to bed (as said, that usually happens later than 10pm) and read him “the story of the planets“. The book has too much text, so I just tell him funny things and curiosities about the planets. He loves it! Yesterday, as every Sunday, it was he and me alone (and Luci, our little dog), as mum works on the weekends. It was another sunny day in Sydney, and I really wanted to go to the beach (some friends were actually meeting in Manly). But Luke didn’t want to go anywhere, he wanted to stay at home playing with the many toys and books he has. Eventually he went to his bedroom and came back to the living room bringing the book with “the story of the planets”. He wanted to play with it. Then I asked him: “do you want we make planets to put in your bedroom?“. A second after that he was just jumping and laughing, excited as crazy, “¡sí, sí, sí, papi!”. The planets that my son & me make yesterday. Sizes are NOT in scale. Mercury was easy. For Venus and the Earth we used a glass and just painted with oranges-brown (Venus) or green-blue (Earth) colors. Mars was also easy just painting using red colors. I tried to add the details of the polar caps (the same that the clouds on the Earth) but our white crayon didn’t work well with the pen markers. Jupiter was fun, we used the empty box of a large yogurt (actually, that is where he has his pen markers, pencils and crayons) and just did stripes in orange colors over a yellow background to follow the Jovian bands. We added the detail of the Giant Red Spot with a red pen maker. We used a similar trick to draw Saturn (of course, this is Luke’s favorite planet) and then added the rings using a new piece of white A4 paper. Saturn’s rings were indeed the most difficult part to get, and I’m still not convinced of the result. In reality the are not that dark, and its shape is funny. We then just finished with the ice giants Uranus (pale blue with not many details on the disk) and Neptune (green-blue including some details in the clouds, and the “Great Dark Spot”). Once this was done, Luke was really happy with “his planets”, and was counting them and naming them all the day. But I waited to the night to put them on his bedroom. 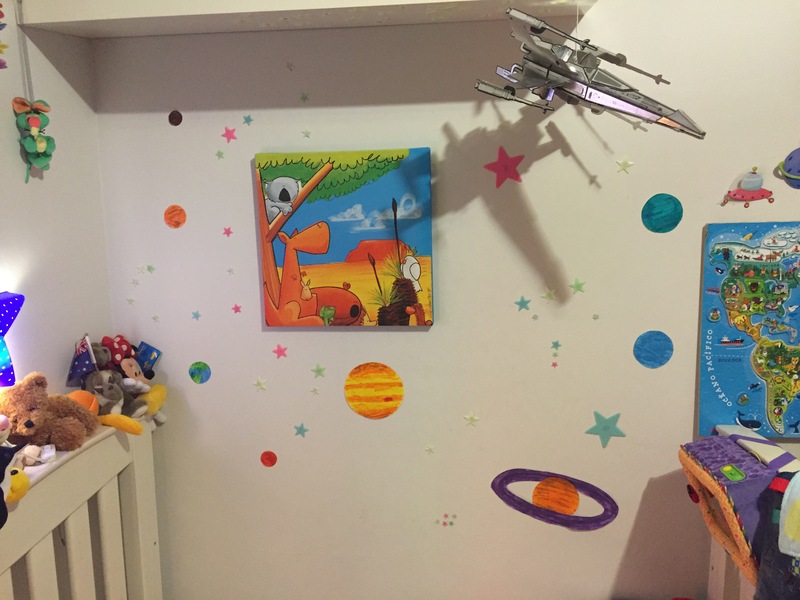 My son’s bedroom wall with stars and planets (and the X-Wing, of course). At 9pm I said “let’s go to put your planets in your bedroom, and I’ll read you the story of the planets” and he went happily to bed. We used bluetag to do this. The result is really nice, and he is so exciting about all of this! And, yes, we didn’t make Pluto because it is not a planet. But, don’t worry, he already knows there are other things in the Solar System: the Sun, asteroids, comets and five dwarf planets (Ceres, Pluto, Eris, Haumea and Makemake), as well as many planets have also moons! We’ll eventually make many of them. (*) Why teaching Luke Greek letters? Well, stars are named with Greek letters (e.g., Alpha Centauri) , and I remember it took me a while to memorize that when I was a teenager. But, more importantly, Physics and Math equations are written with Greek letters. And I write many of these in his blackboards. Yes, I know, he is little, but he is absorbing everything and I’m sure it will not hurt for him to be familiar to, let say, the Newton Equations, although some times I’ve written Einstein General Relativity, Maxwell’s Equations, or Schrodinger Equation. Luke does not pay too much attention to all of that, but he loves reading the Euler Equation “e i π plus 1 equal zero”. Something that really shocked me when I started to live in Australia ~7 years ago was to hear everywhere that seasons start at the beginning of the corresponding month. That is, as today is Sep 1st, everyone in the radio / advertisements / news is welcoming Spring. And this, being an astronomer, believe me, hurts. Why? Because astronomically we are still in winter. Seasons are defined by Astronomy in a very accurate and precise way. This year Spring starts on September 23rd, 11:29 AEST (02:29 Universal Time). That is when that the Autumn Equinox happens, and the real moment Spring starts in the Southern Hemisphere (and Autumn/Fall starts in the Northern Hemisphere). The seasons are caused by the combination of three astronomical factors: the Earth’s is a (almost perfect) sphere, the Earth’s orbit around the Sun, and the Earth’s axial tilt. As a consequence of these the Earth’s atmosphere is unequally heated by the Sun around the year at a given position. Therefore, the seasons are marked by the movement of the Earth around the Sun and, hence, which way the Earth is tilted with respect to the Sun. When the South hemisphere is tilted towards the Sun, the Sun’s rays strike the Earth at a steeper angle compared to a similar latitude in the North hemisphere. As a result, the radiation is distributed over an area which is less in the South hemisphere than in the North hemisphere. This means that there is more radiation per area to be absorbed in the South hemisphere, and therefore it is winter in the North hemisphere and summer in the South hemisphere. 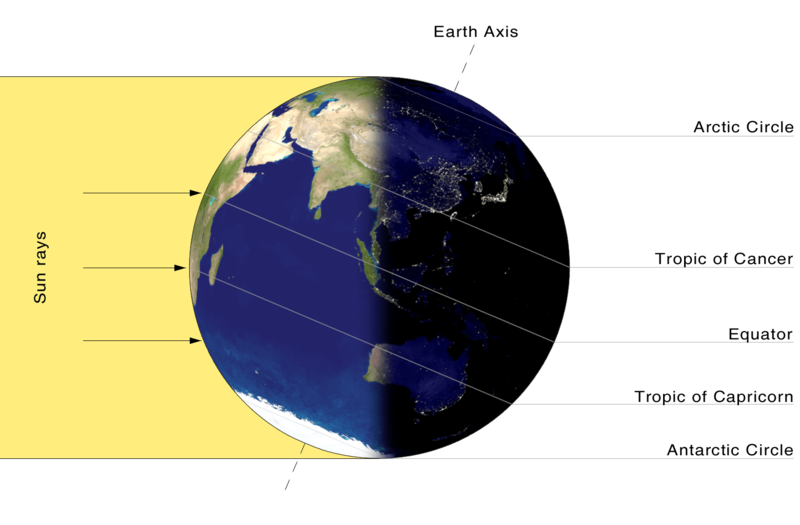 Therefore, in the South hemisphere, Spring starts with the Autumn Equinox, Summer with the Winter Solstice, Autumn with the Spring Equinox and Winter with the Summer Solstice. Of course, the names were given as correct for the North hemisphere. 1. Spring – the three transition months September, October and November. 2. Summer – the three hottest months December, January and February. 3. Autumn – the transition months March, April and May. 4. Winter – the three coldest months June, July and August. Following these assumptions, Australia indeed enters in Spring today, which is funny because the majority of the countries (if not all) of the North hemisphere are still in Summer. In any case, for me it is Winter, and it will be winter till next on September 23rd, 11:29 AEST, when Spring, according to Astronomy, really starts. Today Sunday I’ve used some of my free time to process the images I took last Wednesday, when Saturn was occulted by an almost full Moon. 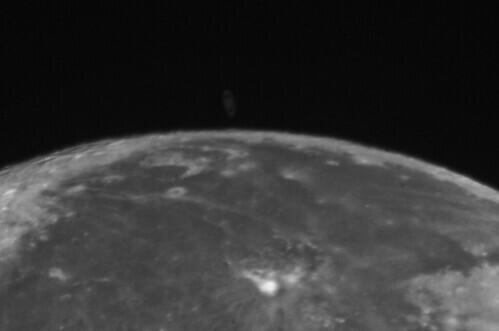 These are my two final images showing how Saturn first disappears behind the Moon and it reappears an hour later. The Moon occults Saturn I: Saturn disappears. Getting nice images of Saturn was much trickier than I expected: the setup I used the other night it is not the best to observe Saturn, as more magnification and a good tracking are needed. On the other hand, the Moon was very bright so I had to use short exposition times, and hence Saturn appeared very dim. At the end I manage to get a kind of “master Saturn” combining the best frames I took during the night and later combine it with the data of each position to get the final view of Saturn at each time. For the Moon it was much easier, although you’ll perhaps realize that the second image is somewhat better than the first. 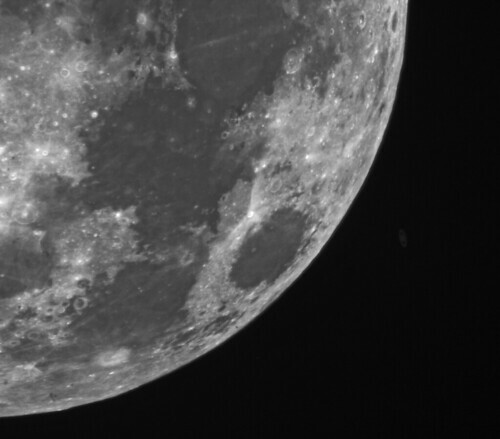 The reason is that some parts of the Moon were actually saturated with the 1/60 seconds exposures, and that is why I later used 1/100 seconds for getting Saturn reappearing. In any case, I hope you like them. 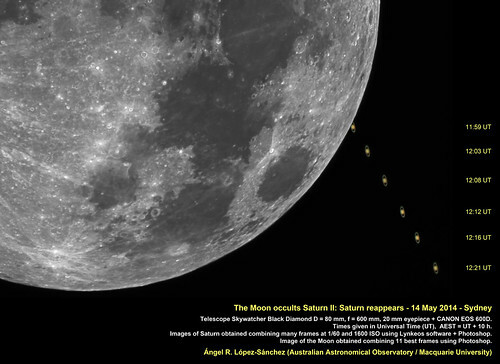 Today, 14th May 2014, Saturn is occulted by the Moon, although this can only be seen from most Australia and New Zealand. I’ve set up my telescope in the backyard and now I’m taking some photos of the event. Although I’ll try to get better images later, let me show you what I’m obtaining now. Occultation of Saturn by the Moon, as observed from my backyard in Sydney. I used my Skywatcher Black Diamond Telescope D = 80 mm, f = 600 mm and my CANON EOS 600D, and a 20mm eyepiece projection, at 1600 ISO and speed 1/60. This is just a single frame obtained at 20:44 AEST (10:44 UT). I also used Photoshop to play with the levels/colours/saturation. Credit: Angel R. López-Sánchez. 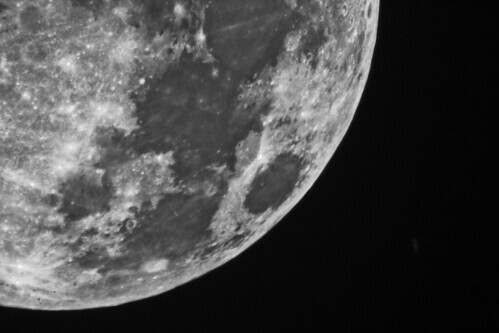 Occultation of Saturn by the Moon, as observed from my backyard in Sydney. I used my Skywatcher Black Diamond Telescope D = 80 mm, f = 600 mm and my CANON EOS 600D, and a 20mm eyepiece projection, at 1600 ISO and speed 1/60. This is just a single frame obtained at 21:12 AEST (11:12 UT). I also used Photoshop to play with the levels/colours/saturation. Credit: Angel R. López-Sánchez. Occultation of Saturn by the Moon, as observed from my backyard in Sydney. I used my Skywatcher Black Diamond Telescope D = 80 mm, f = 600 mm and my CANON EOS 600D, and a 20mm eyepiece projection, at 1600 ISO and speed 1/60. 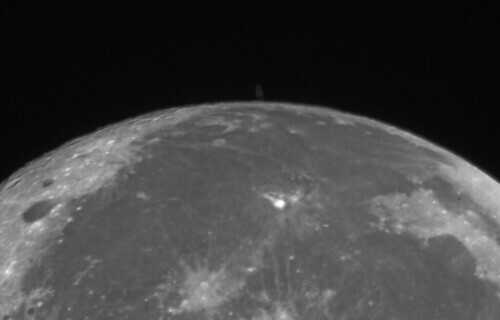 This is just a single frame obtained at 21:18 AEST (11:18 UT), the planet is “touching” the disc of the Moon. I also used Photoshop to play with the levels/colours/saturation. Credit: Angel R. López-Sánchez. Occultation of Saturn by the Moon, as observed from my backyard in Sydney. I used my Skywatcher Black Diamond Telescope D = 80 mm, f = 600 mm and my CANON EOS 600D, and a 20mm eyepiece projection, at 1600 ISO and speed 1/100. This is just a single frame obtained at 21:59 AEST (11:59 UT). I also used Photoshop to play with the levels/colours/saturation. Credit: Angel R. López-Sánchez. 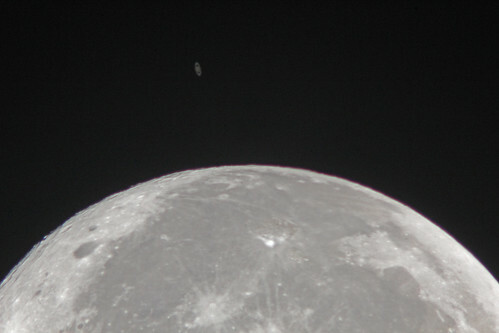 Occultation of Saturn by the Moon, as observed from my backyard in Sydney. I used my Skywatcher Black Diamond Telescope D = 80 mm, f = 600 mm and my CANON EOS 600D, and a 20mm eyepiece projection, at 1600 ISO and speed 1/100. This is just a single frame obtained at 22:05 AEST (12:05 UT). I also used Photoshop to play with the levels/colours/saturation. Credit: Angel R. López-Sánchez. Occultation of Saturn by the Moon, as observed from my backyard in Sydney. I used my Skywatcher Black Diamond Telescope D = 80 mm, f = 600 mm and my CANON EOS 600D, and a 20mm eyepiece projection, at 1600 ISO and speed 1/100. This is just a single frame obtained at 22:15 AEST (12:15 UT). I also used Photoshop to play with the levels/colours/saturation. Credit: Angel R. López-Sánchez. In the next few days I’ll prepare some few better (processed) images. Stay tuned! Besides being an astrophysicist I’m an active amateur astronomer. After 6 years living in Australia, finally in May 2012 I bought my own, small amateur telescope: Skywatcher Black Diamond Refractor Telescope, with an aperture of 80 mm and a focal distance of 600 mm. It provides beautiful images of the sky. However, besides once while stayed at Siding Spring Observatory and the two “great astronomical events” of 2012 (and the final reason I got the telescope), the Transit of Venus in June and the Total Solar Eclipse in November, I have not had too much time to play with this toy. 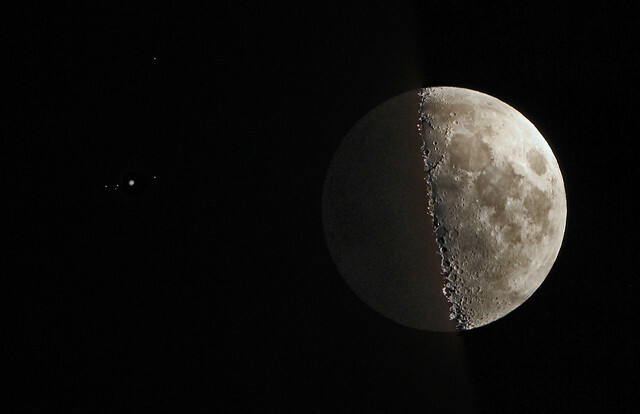 Conjunction between the Moon and Jupiter observed from Sydney on 18th February 2013. 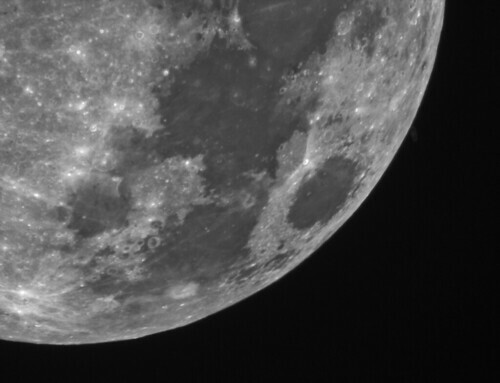 I used my Skywatcher Black Diamond Telescope D = 80 mm, f = 600 mm and my CANON EOS 600D at primary focus, at 200 ISO. It is a composition of two images: one taken at speed 1/60 and another at 1/10. I did what I could to get a nice balance between them. Credit: Angel R. López-Sánchez. 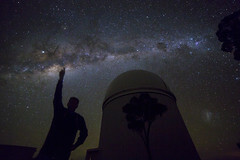 After this, I decided to try to find the bright comet Lemmon 2012 F6, that was located near the Small Magellanic Cloud. It was actually easier I thought and, besides the light pollution, I got it. So on Tuesday 19th, again clear, I prepared the telescope but this time including the motors and performing an alignment of the mount to the South Celestial Pole. 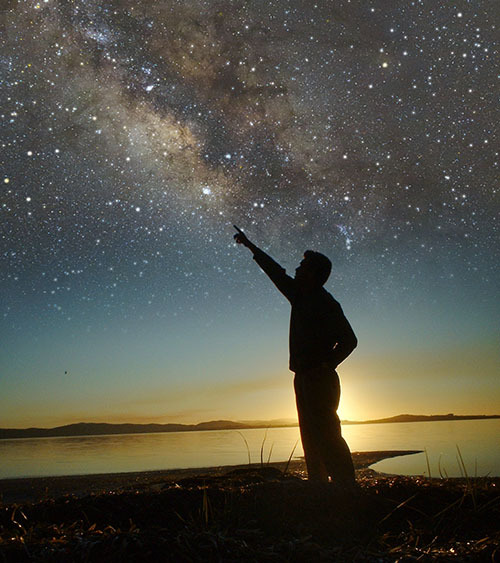 This task is not easy when there is too much light in the sky, as the stars used to do it are faint. 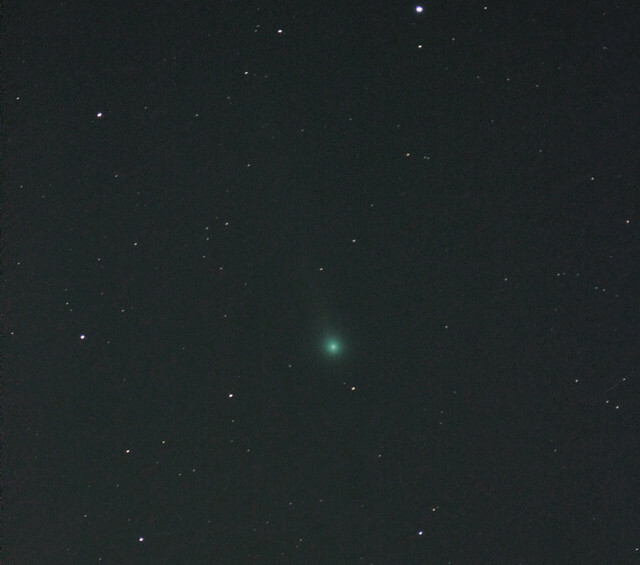 At the end I got this view of the comet. I was not able to detect the tail with my eyes, however it does appear when combining several frames, as I did for this image. 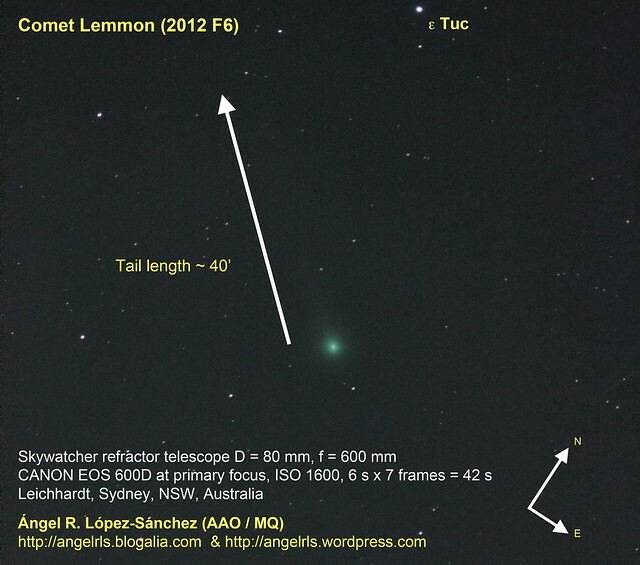 My vision of the comet Lemmon 2012 F6 from Sydney on Tuesday 19th February 2012, at 21:20 AEST (10:20 UT). I combined 7 frames of 6 seconds exposure each (42 seconds total exposition time), at 1600 ISO using Skywatcher Black Diamond Telescope D = 80 mm, f = 600 mm and my CANON EOS 600D at primary focus. Note the faint tail moving towards the upper-left. Credit: Angel R. López-Sánchez. Annotated version of my vision of the comet Lemmon 2012 F6 from Sydney on Tuesday 19th February 2012, at 21:20 AEST (10:20 UT). I combined 7 frames of 6 seconds exposure each (42 seconds total exposition time), at 1600 ISO using Skywatcher Black Diamond Telescope D = 80 mm, f = 600 mm and my CANON EOS 600D at primary focus. I have included an arrow folowing the faint tail, the orientation, and the position of the star &epsilon Tucanae. Credit: Angel R. López-Sánchez. To get a good focus I decided to use the famous Jewel Box star cluster, very close to Mimosa (β Crucis). 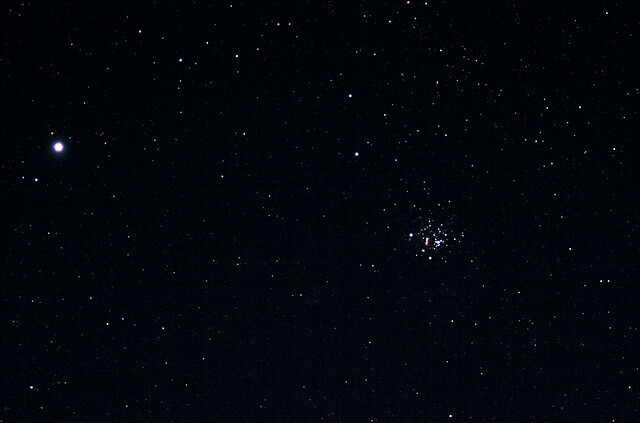 Image of the “Jewel Box” star cluster (NGC 4755 or Kappa Crucis) in the Southern Cross from Sydney (actually, 4 km from the city center) on Tuesday 19th February 2013, 20:50 AEST (09:50 UT). It combines 6 images with 5 seconds exposure each ( 30 seconds total time) at 400 ISO, using a Skywatcher Black Diamond Telescope D = 80 mm, f = 600 mm and my CANON EOS 600D at primary focus. 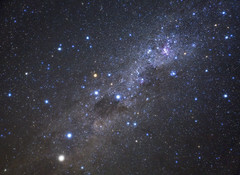 The bright star at the left is Mimosa, β Crucis, one of the brightest stars of the Southern Cross. Credit: Angel R. López-Sánchez. Any of these images are very spectacular but considering that they have been taken just 4 km from the center of Sydney, with all the light pollution, plus the extra “fight” with the mozzies, I’m happy to share them with you.